I'm popping over to tell you two bits of big news! It's all so exciting and I do hope that you will join me on this new adventure. First up...Under An English Sky has a new home and new name so this will be the last post at this address. From today you can find me at Building a Household of Faith. I have long had it on my heart to minister to women who are raising and educating children, who desire to make their places of ministry their marriages and their homes. Women who aspire to be a Proverbs 31 woman. So it is with purpose and faith that I am stepping out and trusting that God will grow and bless this ministry. We've been on this homeschooling, homemaking, season keeping, faith journey for so long that I would be so sad to lose the friendships and connections that I have made on this blog. If you are still interested in staying in touch and reading my blog, then please do hop on over to my new website and be sure to subscribe to continue to receive blog updates and encouragement on your homeschooling and family raising journey's. If British home educators are interested in detailed posts on how to take the American SAT in the UK then be sure to sign up there too as I will be publishing a series of posts dedicated to this process now that we have successfully navigated this route. The other very exciting thing is that I will be speaking on the American SAT as an option for British home educators at the Learn Free Home Educating Conference in May! The conference will be held in Coventry on the 18th of May. There are some great speakers this year including Leah Boden from the Wild + Free Community. I am thrilled to have been asked to speak at this year's conference and would love to meet you if you are going. Visit the Learn Free Conference Website for details. Under An English Sky will remain here and continue to be focused on the more personal side of things such as my crafting, thoughts, places we visit and so on. Nothing changing too much but it really will remain a bit of a hobby blog so if that's not your thing I understand. For more focused encouragement and inspiration on becoming that Proverbs 31 woman in the areas of homeschooling, keeping home etc then Building a Household of Faith is the place to visit. 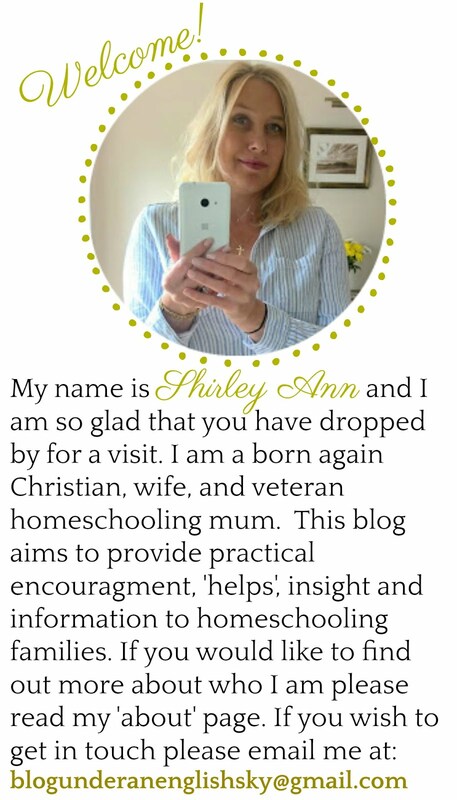 Throughout our homeschooling, I have always had a heart for encouraging other homeschool mums on their journey. I am blessed to be able to walk with someone who is considering homeschooling, or those who are struggling and need a bit of guidance. The Lord has brought a few women into my life whom I have had the privilege of walking alongside and who I now count as friends. Some of these women I have never met in person although I look forward to the day when we hopefully will get to meet. 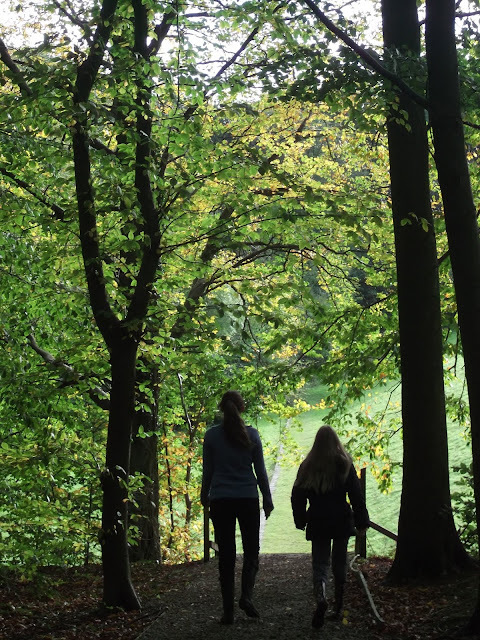 We have always sought God's direction in our homeschool, and let me tell you it did not look like the direction my fellow English homeschooling friends were taking. We kept with our Christian resources, our American resources. 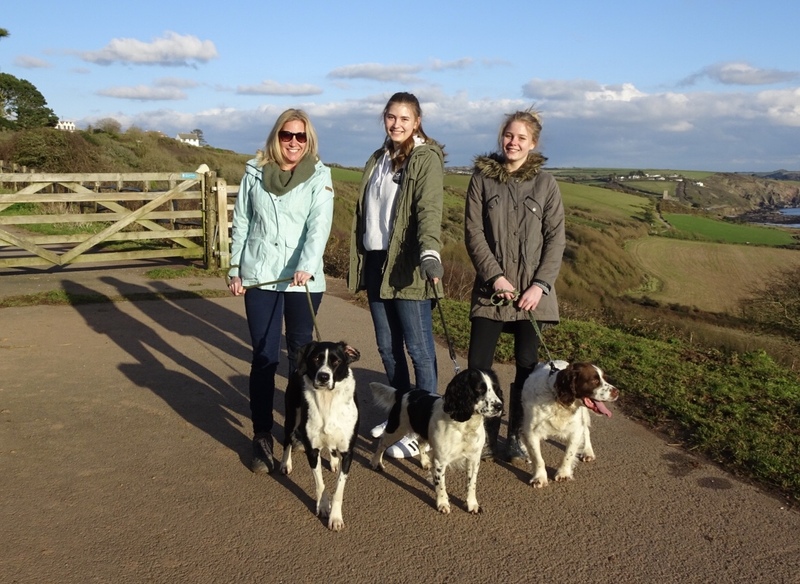 Both our girls sat their IGCSE English and Maths but they don't have the raft of GCSE's that apparently you need to get into university or even a level 3 college course. I definitely went through many times of panic once we decided not to take the GCSE/A-Level route but I felt strongly that this was not for us and that we should stay true to God's calling for our family. The Lord promises that if we seek first His Kingdom and righteousness that all else will be added to us (Matt 6:33) and that if we trust in Him and lean not on our own understanding He will make our paths straight (Prov 3:5-6). I clung to His promises hoping like mad that I wasn't destroying my children's futures. The Lord called us to raise our children for him. We were to teach them His ways while we sat at home, walked by the way, when we lay down and got up (Deut6:7), I struggled to reconcile myself to the fact that this was our calling and then suddenly, when we reached this high school stage, I was to abandon all that and 'fit in' with the English educational system which was at polar opposites to our educational methods and ethos. There were times when I was quaking I can tell you. My friend and mentor, Sonja Woods from Oikos Family Ministries in South Africa was the person I would talk to when I had 'A Moment'. She always reminded me of Gods goodness and of His faithfulness. Her own testimony was inspirational and it is to her that I owe much for the time and encouragement she gave me. So we stayed the course. DD1 was accepted without a problem to art college based on her transcript and art and nature journal. The interviewing tutor could see her passion and she herself believed in alternative forms of education. DD1 proved to be one of their model students and graduated with a distinction last year. She has since been accepted onto a Graphic Design and Illustration course at University and starts in the fall. DD2 has taken the full American SAT route and today was offered a place at Chester University to study Fashion Communication and Marketing. Again, the head of the department believes in alternative forms of education. * That what the scriptures say is true. God will be faithful if we are faithful to trust him. He goes before us and opens doors that we don't think can be opened because if He has a plan for our children no man and no requirement of man will stand in His way. He is the author of all things. * Having a Plan. As a homeschool mom, you need to plot and stay your course. Choose your route and do your utmost to find out everything you can about it and execute your plan with planning and purpose. You are your child's best advocate so don't be afraid to be prepared to take on colleges and universities who don't understand alternative qualifications. Personally, I found more opposition at college level than I did at university level, but stand your ground. * Keeping excellent records. I can't stress this enough. If you have precise records of your learning and grades each year you have all the evidence you need to prove your case of your child has received a well rounded and most excellent education. 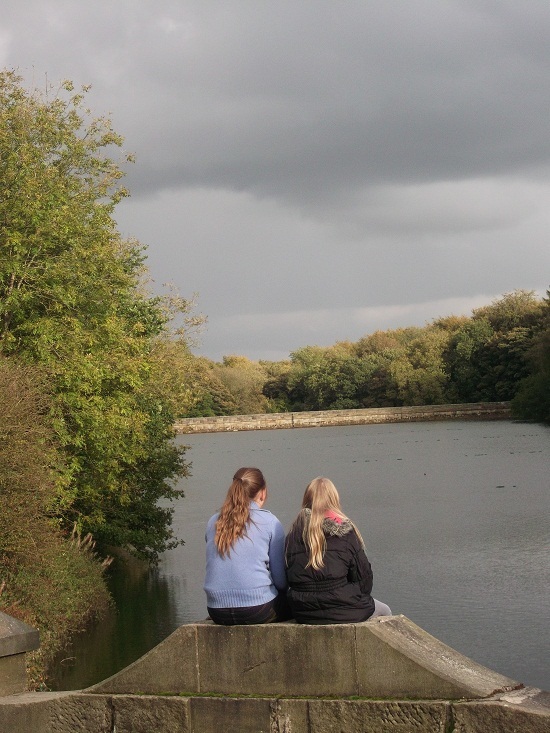 Now that we have navigated this path with success I feel like I am able to share this alternative way with UK homeschoolers so I will be writing a series of posts on the what, how, where, etc on the SAT route in England so please do bookmark my blog if you are interested to find out more. Do drop me an email if you have any questions, I'm always happy to help if I can. 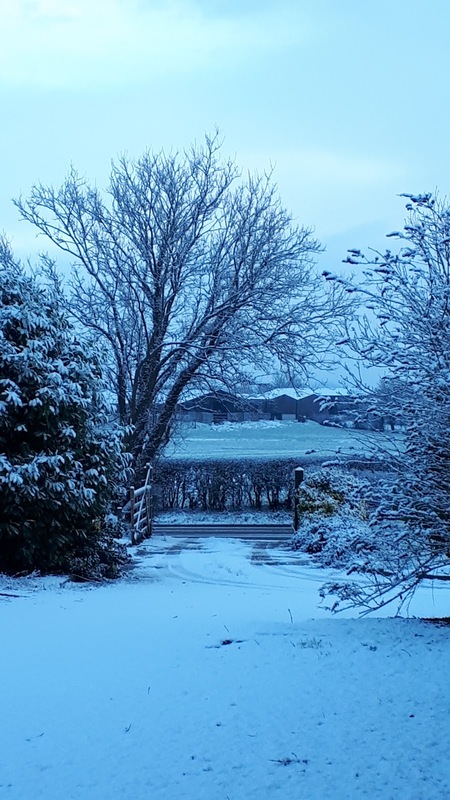 Last Week in January :: First Snow! 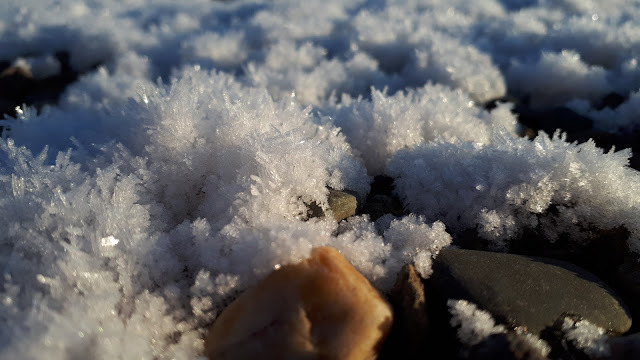 We had our first snowfall this week. We woke to a winter wonderland on Wednesday morning, I'm so SO glad to be back in the north. This is what I missed when we lived in Devon. 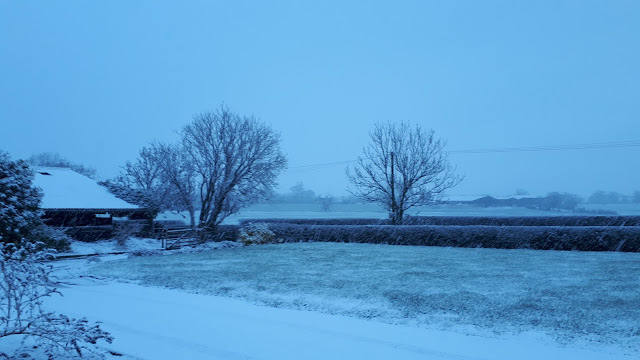 I love that weird grey/blue colour that the world seems to turn when it's snowing. ...and watching the snow gently fall to the ground. I will never tire of watching it fall from the heavens, there is something quite peaceful and mesmerizing about it. Hoar frost had formed on the previous days' snowfall. 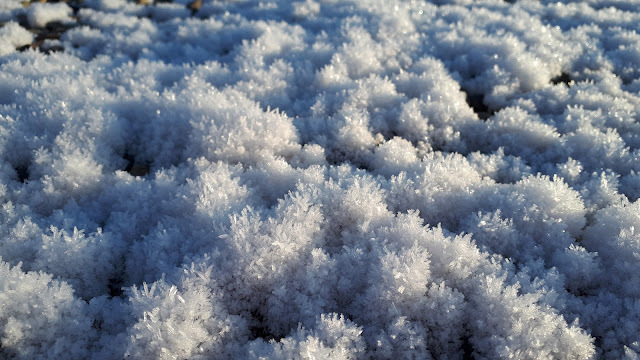 Like tiny little crystal trees, so pretty! I seem to find less and less time to spend here these days. I have the best of intentions but since starting my degree a lot of my time is taken up with that. This week I have assignments due, so a lot of time has been taken up with that. Although my days are busy with academics of all types, my daughters and my own, I do try to find time to do the things that I love such as rambling in the countryside and of course, working in my nature journal. 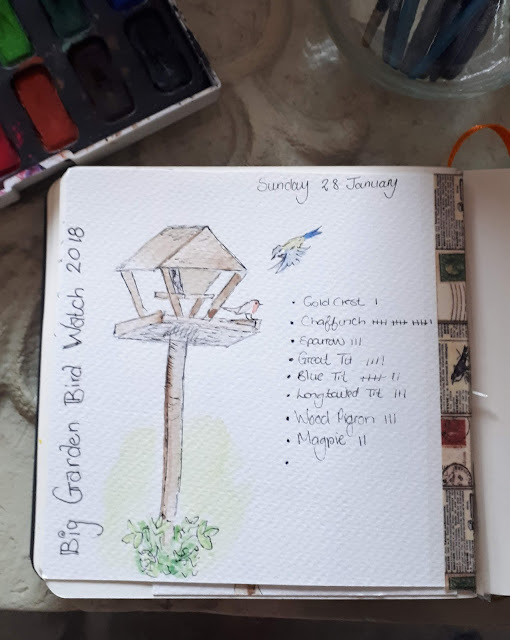 Above is my Big Garden Birdwatch page. Each year I create a page to mark this event, it's become a bit of a journal tradition. 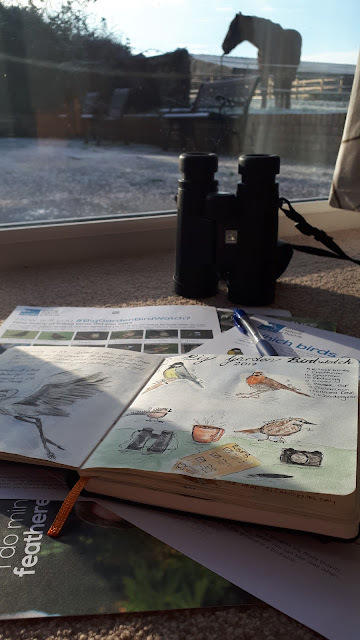 I hadn't done the bird count at this point in time but I have since added to the page on the right. I had a really good count this year. On Monday we went for a walk across fields, down country lanes and alongside hedgerow paths. It was so cold but look at that sky and that cloud formation! So beautiful. 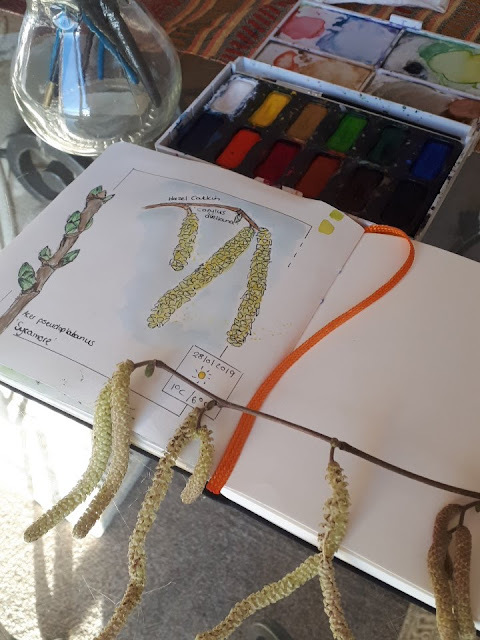 We found some hazel catkins on our walk so we brought them home to draw into our nature journals. I adore how they all blow about in the wind. Another name for them is 'lambs tails' which is quite sweet. They do indeed look like lambs tails all hung up to dry blowing about in the cold January breeze. Nothing like a good country walk to clear away the cobwebs and refresh the mind! 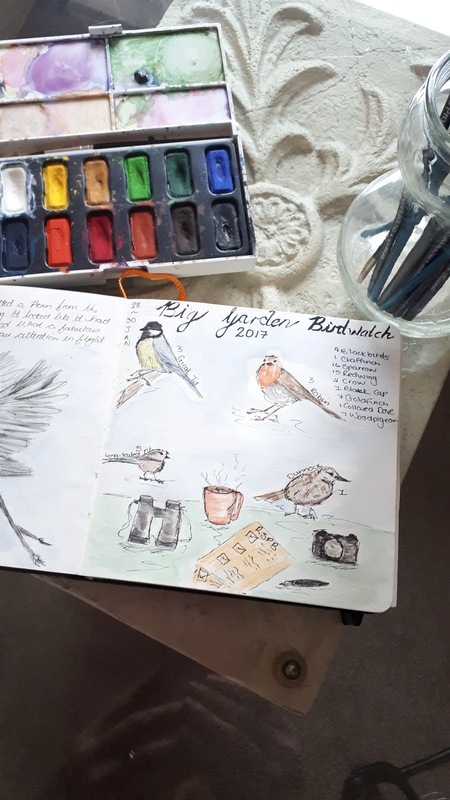 The Big Garden Birdwatch is happening this weekend and we are all set! We've been participating since 2014 and it is something we look forward to doing in our homeschool. It is a great citizen science project after we have spent an hour counting the birds that visit our feeder we log into the RSPB website and submit our results. 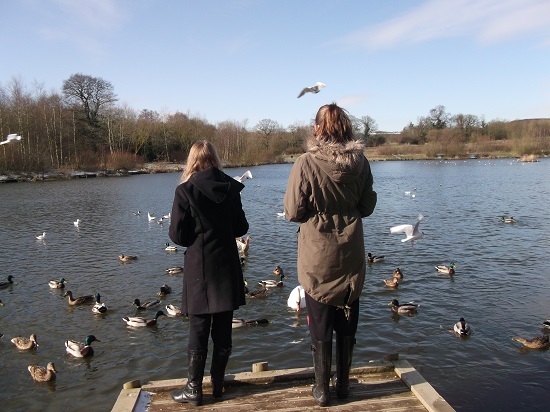 This helps them keep an eye on the various species of birds, monitoring the health of their numbers. This year is a little different because we are now on a farm. 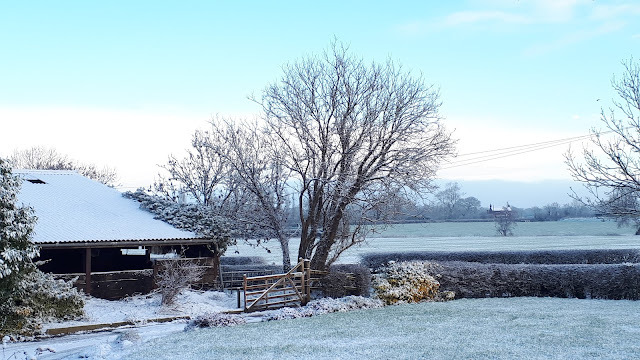 We get lots of starlings picking about in the horse's field in the morning and for the first time since we moved to the UK, I've spotted numerous red wings picking about the field with them. I'm contemplating my nature journal entry for this years bird count. My most favourite entry was the one from 2014. Every time I look at it I am taken right back to that day for some reason. I think it has something to do with sketching not only the birds but the setting as well. I think I'm going to do something similar in my journal this year. If you are in the U.S then why not participate in a similar project called the Great Backyard Bird Count? 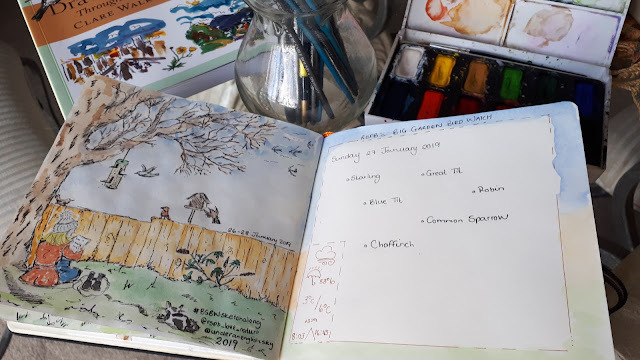 This year it is running from the 15th to 19th of February, so lots of time to get organised and plan it into your nature studies. In the past, we have made some tasty bird nibbles for the occasion. Pinterest holds a goldmine of ideas. 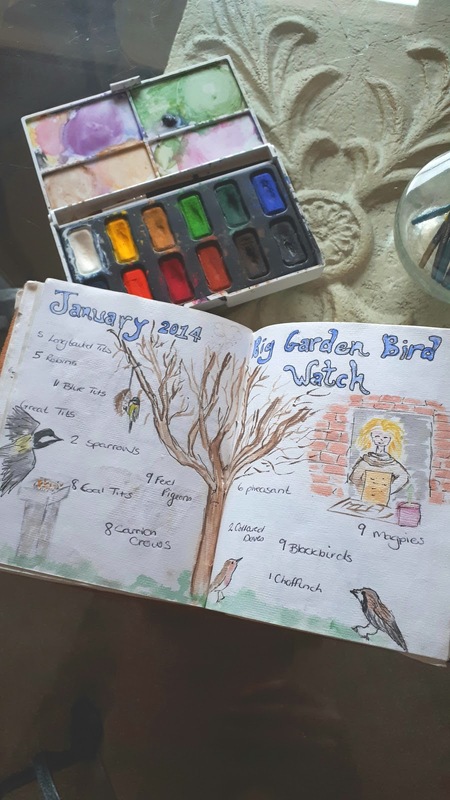 Right, I'm off to prep my journal page...wishing you all a blessed weekend. Celebrating Nature - All Year! 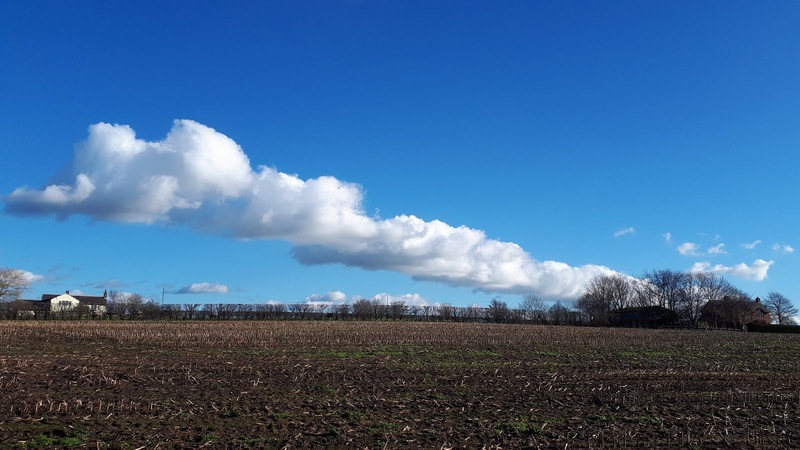 COPYRIGHT 2011 - 2018 UNDER AN ENGLISH SKY. ALL RIGHTS RESERVED. Simple theme. Powered by Blogger.